Codeforces Round #509 will be held on Sep/16/2018 13:35 (Moscow time). The round will be rated for Div. 2 contestants. There will be 6 problems for 2 hours. Please, notice that the start time is unusual. The round will be rated for the div. 2 participants. The statements will be available in Russian and English languages. The round will start 2 hours after the start of the Qualification Stage, so they will finish around same time. That's why we ask the participants of the Quals to stay silent and don't share the statements of the contest with anyone. Unfortunately, we cannot add all the problems from Quals to the round, it will contain only six problems. The problems for the official contest were prepared by the guys from the jury in the person of Alex fcspartakm Frolov, Adilbek adedalic Dalabaev, Ivan BledDest Androsov and me. We also would like to express our gratitude to Anton arsijo Tsypko for coordination of the round and Mike MikeMirzayanov Mirzayanov for the permission to make a mirror and Codeforces and Polygon platforms. Also big thanks to the testers: IlyaLos, Perforator, kuviman, HolkinPV, zubec, StasyaCat, Karasick for testing. As usual, the scoring distribution will be announced just before the round. After 9 days, wait is over. Early tomorrow morning there is also the Qualification Stage of Singapore (mirror available on Kattis). How to solve D and E? You can refer here (Question is a bit similar to this) to find all cycles in D.
One observation — if there exist 2 edges of a vertex which leads it to 0 then this vertex belongs to the soln set => vertex belongs to cycle. Now all cycles which have zero as vertex belongs to the soln set. And If at least one vertex of cycle belongs to soln set then all vertex belongs to the soln set. So dfs2 was made to find soln set which marks all cycles which belong to soln set. And then runs dfs2 for all vertex of this set. Thank you, I got ACed. Another approach for D that I found after contest time (should give some credits to my friend liv1n9 for some ideas within it, not sure if this was his exact approach coz' I didn't fully manage to get his words :D). A junction can be considered safe if there are at least 2 paths from junction 0 to it (obviously, junction 0 is a safe junction itself). Therefore, I'll transform the given undirected graph to a directed graph (each bidirectional edge will be considered as 2 edges between two junctions, just with different directions). The first traverse will give me a directed subgraph (consisting of directed edges) that allow me to reach every junction from junction 0 (yet not the other way around). After that traverse being complete, I'll delete that whole subgraph. The second traverse will let me know if each junction is safe (i.e. there exists another path from 0 to that junction, after deleting the first path given in the previous subgraph). The subgraph deletion can be handled easily if adjacency list of each junction is maintained by a set instead of vector/array. Because deleting a subgraph will delete 2 of 3 edges. And based on which 2 edges are deleted remaining graph will have 0 or 0,1 or 0,2 as an answer. But in fact, all 3 vertexes are in soln set. Actually, I should apology for my explanation being a bit vague. The subgraph being deleted is a directed one, that means I'll only delete the edges that can lead from junction 0 to other junctions (but not the other way around). Therefore, after 1st DFS, directed edges (0 → 1), (1 → 2) will be deleted. The second DFS can still reach all other junctions (one possible path is 0 → 2 → 1). (Explanation edited in the main comment as well). How to solve C, E ?? You can binary search the answer: with each value z, build a bipartite graph that, there exists a edge between (xi, yj) if aij ≥ z. z can be the minimum value of a combination if the maximum bipartite matching of the newly built graph equals exactly N — this could be solved by maxflow algorithms. You can solve C using dynamic programming. First observation: after building N characters, we can uniquely determine the last N characters. So let's dp(i, j, k) be the number of ways, we are at i-th character, already at j-th character of string s from prefix and at k-th character of string s from suffix. Then answer will be sum of dp(n, j, k) where j >= k.
i don't understand this line properly. "The round will start 2 hours after the start of the Qualification Stage, so they will finish around same time." can you please explain it in details? when i can start? from the qualification stage? It is rated for Div2. My rating is 1900+ is it rated for me? Perfect time for Chinese users! the begin time is so good! I'm Chinese too. The time is really wonderful! It Was So long time. Ajosteen, are problem statements gonna be long like in NEERC rounds or adapted to CF round? The statements' format will be as in usual div2 rounds. Personally speaking, I think that Codeforces is the best oj in the world. My submission has been staying in queue for 5 minutes, any help ? I have much more penalty on pC because of the queue, can I have some points back? Edit: Actually, 40 points won't affect me too much, but I feel sad for those who were actually affected by the delay. Btw how to solve F? I could reduce it to finding maximum number of points lying on a straight line in a given set of points,but couldn't use the property that distance between adjacent points(along one co-ordinate) is same. you only need find the answer for every t which is power of 2. I guess you can find an answer of every power of 2 .
test case 5 on problem d ? The answer is 5. Wrong solutions might output 9. 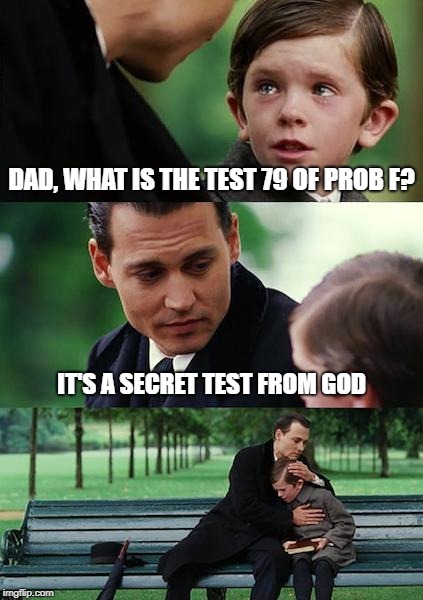 Anyone has idea what pretest 7 for C is? It was saved in drafts. Why i can't see another's solutions? Each input must be in the form of i n since node n will fall into one of the parts after erasing an edge. If i n exists multiple times, add nodes with smaller indices between them. Isn't "RIP all contestant who didn't thought that A can be equal to B in F" ?? Wait, so it turned out that the clarification for my question is incorrect? When your question arrived, the only thing I had in mind was "A and B are on the different sides of the tube, how can they be equal?" I haven't thought that the question was about x-coordinates. I could not solve F in time, so it didn't affect me anyway. would the answer be 1 or 2 (ray bouncing off vertically)? It should be 2, since there is no restrictions on relative positions of A and B. I'm sorry for the absence of such test in the pretests, trying to break some clever solutions, I forgot about this basic one. 2. I got hacked for this case. One more bit of information in addition to what you've said: http://www.cplusplus.com/reference/algorithm/upper_bound/. Complexity On average, logarithmic in the distance between first and last: Performs approximately log2(N)+1 element comparisons (where N is this distance). On non-random-access iterators, the iterator advances produce themselves an additional linear complexity in N on average. After you've erased the element, the iterator is invalid. Essentially, it can be seen as a nullptr or any other random trash. It's called undefined behavior. Sometimes iterator might still point to the memory which has useful data, sometimes it might not. If I submit a solution at time t, my submission is inque for a hour, what's the final submitted time of the solution? t or t+60? Of course t. Penalty is counted by the time of submission, not by the time of judgement. http://codeforces.com/contest/1041/submission/42933160 http://codeforces.com/contest/1041/submission/42936047 These two submissions are the same. There may be more cases like this. sans21 amc1996 pls upvote gourav comment. I can't make a submission, seems like practice mode is disabled. Is this supposed to happen? Practice mode is disabled during system testing. You can submit now. I know that. Systest was over, and usually practice mode is instantly enabled. Thanks for answering anyway! How does this soln passes System Test Cases? It iterates from 1 to 1e9 in worst test cases. I got 5 unsuccessful hack because of this(-_-). When somebody being a candidate master and can edit tags. I would be grateful if someone could explain briefly what is the cause of such behavior. Arguments of any function/constructor could be calculated in any order (it's not strictly wrote in C++ standart). Thus, some compilers use left-to-right calculations, some of them use right-to-left, some of them could even use some crazy rules. The number of tags (algorithms that can be used to solve the problem) of problem C, D and E is huge and impressive. :) Ajosteen, thank you very much for this awesome and interesting contest. So why do I think that D is much easier than C?For D u just need to get the prefix sum and do lower_bound.I get WA on pretest 9 of C :(. Its okay as long as you keep getting ideas. Some of us dont even get the idea. Time will improve with time. Dont worry. Wrong answer on sample test cases isn't supposed to get time penalties, correct? I accidentally submitted an incorrect solution to the 3rd question (which was wrong on sample test case 2) and I got time penalty. Is this wrong or am I incorrect? Only failure at the 1st test can be ignored. 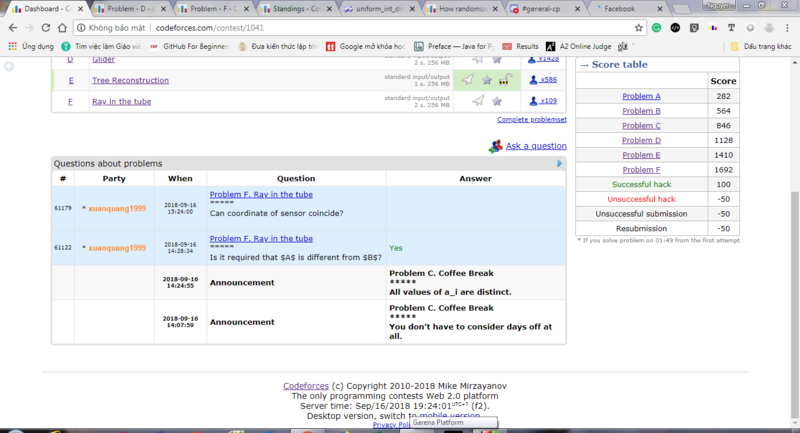 Anyone knows how to add Codeforces contests to google calendar? Can problem D get a DP tag too? My approach was to calculate the covered distance when I start from the i'th segment and using previously stored data of other segments which are already calculated. Of course, there are better approaches to this problem. sorry,codeforces,i feel surprised that i will receive a letter from you. As a foreign person, i often attend some contests in cf. But i not always get good grades, because my contest skills and English are not so good.I don't want to become green pupil, i just want to be a specialist.In the contest, i copy my friend's coding, this is truth,i don't want to hide from responsibilities.At first,i want to do D problem, because i have done the similar problem before. Unfortunately,there is some thing wrong with my coding. But i don't want to decrease my rating, so i copy. At first, i don't know CF can find the problem, maybe AC automation or trie? And i don't know CF will consider the problem so seriously. I swear i won't do this again. Some people will ask why i don't login a new id, because i don't want to let my story faded away.I want to record every contest, so i can always let myself keep hardworking.I will keep practicing,please don't look down me. All in all, i'm very sorry, i won't do this again. oh, and i can do problem c, but i want to increase my rating more, so i just saw D.10minutes is not enough for c. Also,my stl is not so good. Can somebody help me in problem C 43011918, i am getting the message "wrong output format Unexpected end of file — int32 expected" on test case 13 ,but i am not able to find any such mistake where i am accessing value from any wrong index.Thanks in advance! Full Qualification Stage have been added to Gyms. Server time: Apr/22/2019 20:16:18 (e1).